Just announced at the New York Autoshow: Ford Motor Co. plans to extend their small SUV family by creating a Lincoln-Mercury version of the Escape! 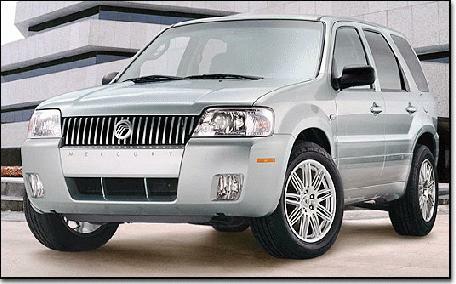 Mariner will be Lincoln-Mercury's entry-level SUV. It is one of four new vehicles Mercury will introduce in the next three years. The others are: the Monterey minivan, the Montego sedan and a new mid-size sedan. 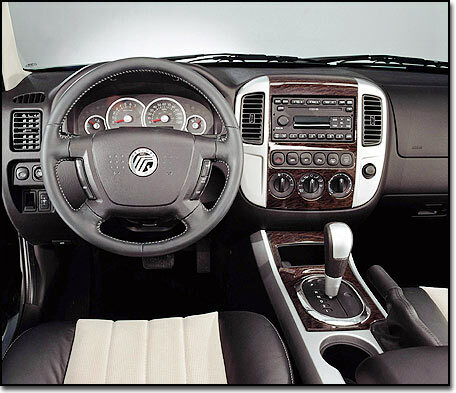 Photos of the new Mercury Mariner and Escape HEV interiors.
. . . Both feature floor mounted shifters. The Lincoln/Mercury's interior is meant to appeal to a more conservative crowd as the target customer market for the new Mariner is some 15 years older than the average Ford Escape owner. has wood grain, satin aluminum and chrome accents. It also has a floor-mounted shifter, which has a chrome surround and a satin aluminum shift knob. 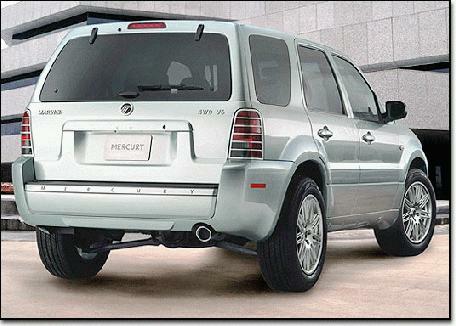 The 2005 Mercury Mariner SUV is Mercury's version of the Ford Escape. The new SUV goes on sale in late 2004 as a 2005 model. Lincoln will offer its production Mariner with front-wheel-drive or four-wheel-drive. The engines offered will be a 2.3-liter, I-4 and a 3.0-liter, V-6. The Mariner concept's wheels are cast aluminum with a satin finish. Here's some pics of the Mercury Mariner. The 2005 Mercury Mariner, which will be produced at Ford's Ohio Assembly Plant in Avon Lake, goes on sale in late 2004. The interior has wood grain, satin aluminum and chrome accents. It also has a floor-mounted shifter, which has a chrome surround and a satin aluminum shift knob. Lincoln will offer its production Mariner with front-wheel-drive or four-wheel-drive. The engines offered will be a 2.3-liter, I-4 and a 3.0-liter, V-6. The Mariner concept's wheels are cast aluminum with a satin finish. A very nicely modded Escape !!! I like the look of the Mariner, and the interior improvements are great! But I am sure the increase on price tag will be there also! Posts: 5288 Mercury Mariner Unveiled!!! Go here and take a gander at the new Mercury Mariner version of the Escape/Tribute. I am sure someone will post photos here shortly on this thread. The Mariner looks significantly different from the front and the tail lamps are different and it has a pretty snazzy interior. I'll have to take a closer look, but go ahead take apeek and see what you think. And if you are one of the computer geniuses that I am not please post some pictures on this thread so that all may enjoy. Did anyone else notice the keyhole in the hatch? Looks like a keyhole, I thought those were becoming extinct on non drivers doors or trunks. Could be the sensor for the back up warning system that is getting put on everthing it seems, I know they're usually on the bumper but you never know. Personally I hope it is a keyhole. Miss the storage cubby where the shifter is moved to, maybe I would stop trying to shift the wiper stalk every now and then at least. wow, what are all the buttons above the ac controls for? BRITAX Marathon LATCH - Colonial Blue Car Seat. They call that interior conservative? Waaayyy too many colors for my taste. You've black leather and dash, cream or bone trim and seat inserts, dark burlwood and brushed aluminum. A single color for the radio bezel and console would look far less busy. And there is too much contrast between the black and cream color. While I defintely welcome the console shifter, I mourn the loss of the white guages and the roof rack. Looks good, I like the front bumper and the interior. Very stylish and non-tacky use of fake wood. Although it probably look better with some light color real wood. also I noticed it has the new 2.3 Duratec I-4. Good news for those looking for entry level Escape... Zetec is on its way out. Also according to the actual news release, ATX will be standard transmission for both I-4 and V6. No MTX... that I don't like.